We adore this image of Sally with her bridesmaids captured in downtown Raleigh at the historic Heck Andrews house. Sally chose her vintage wedding gown from Gilded Bridal in Raleigh, and selected navy blue bridesmaid dresses for her girls to wear. Her beautiful bouquets were made by her mom and family friend, and how stunning are they? 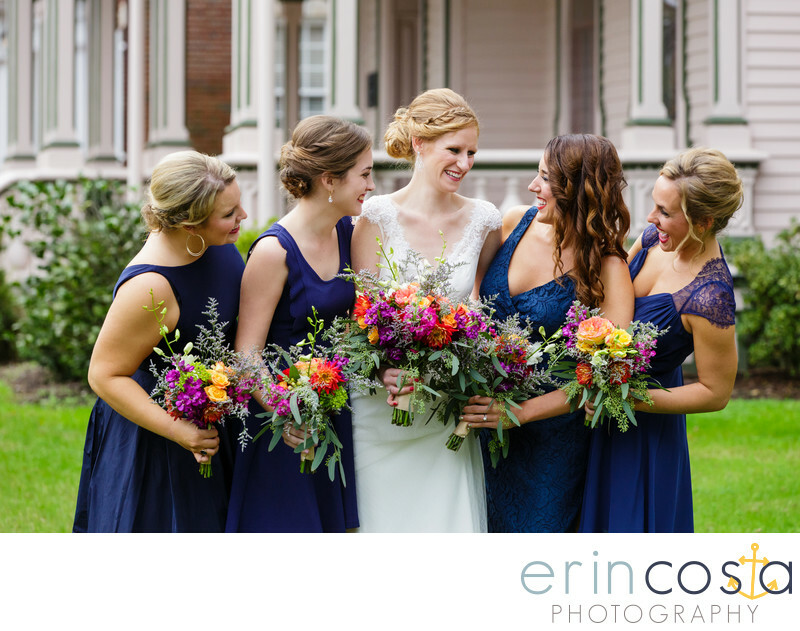 The bright pop of flowers complemented the navy bridesmaid dresses perfectly. Whenever we are looking for locations to photograph bridal parties in downtown Raleigh, we always look for unique locations. The Heck Andrews house was conveniently located right around the corner from Sally's parents house so after Sally & Clayton's first look, we headed over there to photograph the bridal party photos.